Happy St. Patrick’s Day! What are you doing this St. Patrick’s Day? Drinking copious amounts of alcohol? Eating Irish food? Attending a St. Patrick’s Day parade? Whatever you’re doing take a moment to make yourself some home made Irish Soda bread from my easy to follow full-proof recipe! 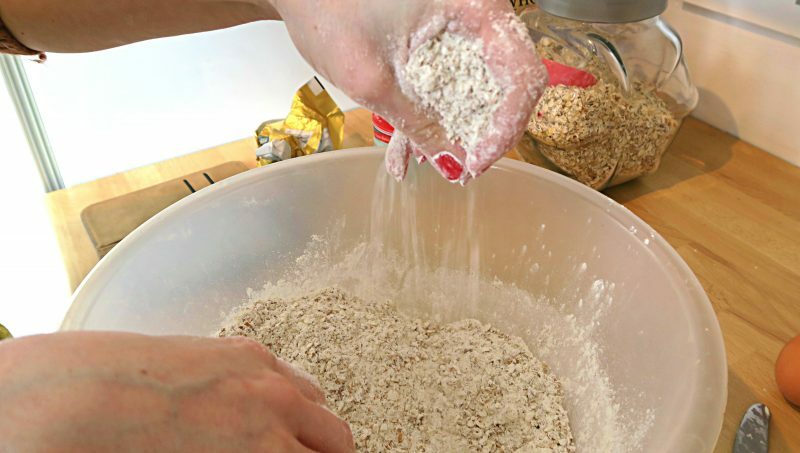 This recipe is so easy even a one year old could make Irish soda bread. Soda bread is called brown bread or wheaten bread dependent on what part of Ireland you come from. 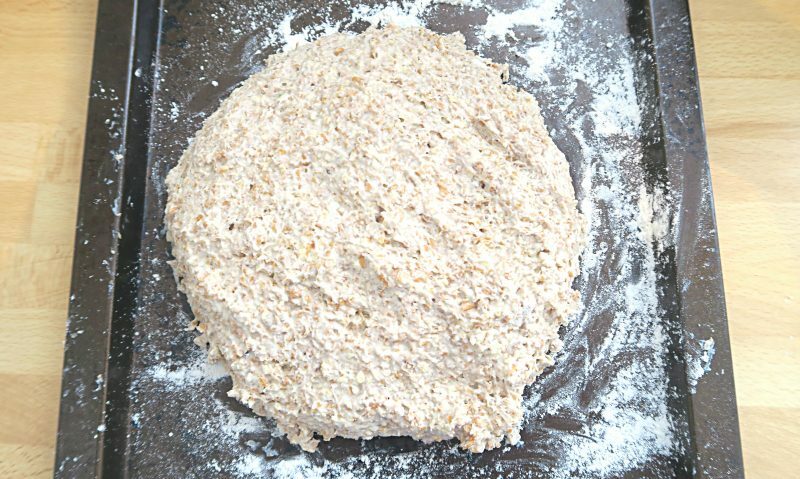 For us in the North of Ireland we call it ‘wheaten bread’ because of the wholemeal wheaten flour it’s made from. Traditionally, this bread would have been baked over an open fire in a cottage or in a cast iron stove in a house. 250g wheaten or wholemeal flour. 2 x teaspoons of baking powder. 1 x teaspoon of salt. 400 ml of water or buttermilk. Heat your oven to 180 degrees or gas mark four. 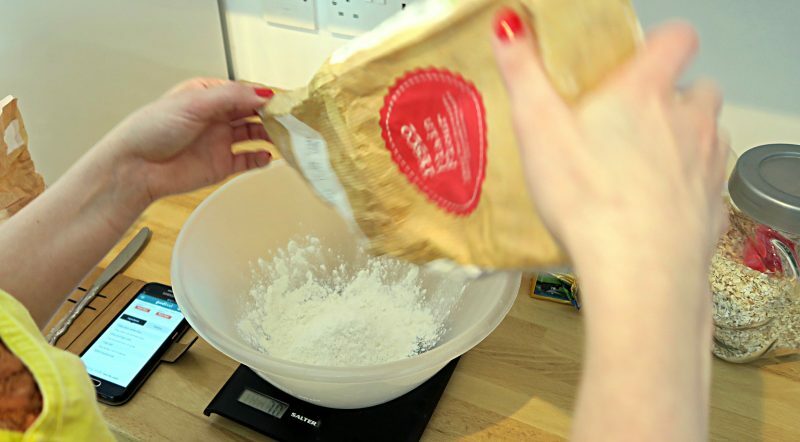 Flour a large, square baking tray so that your bread won’t stick to it when baking and set aside. 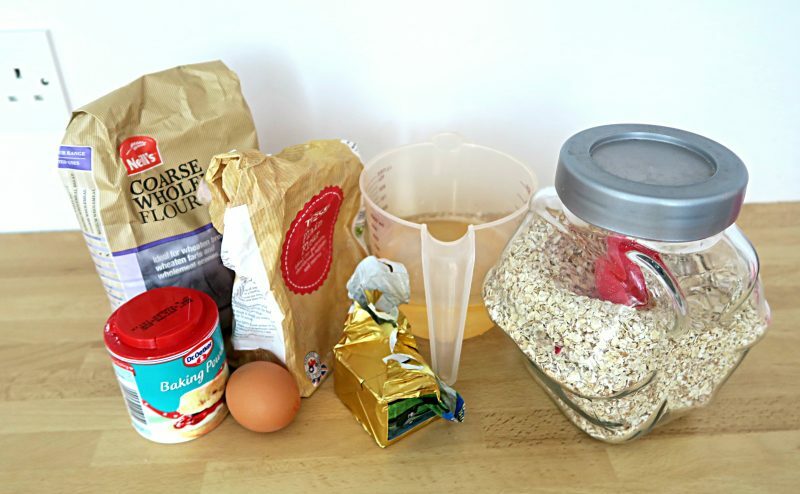 Add all of your dry ingredients (minus the oats) to a mixing bowl and mix together to form the basis of the bread mix. Next add the oats to your dry bread mixture. I just used Tesco value oats as this is what I had to hand. 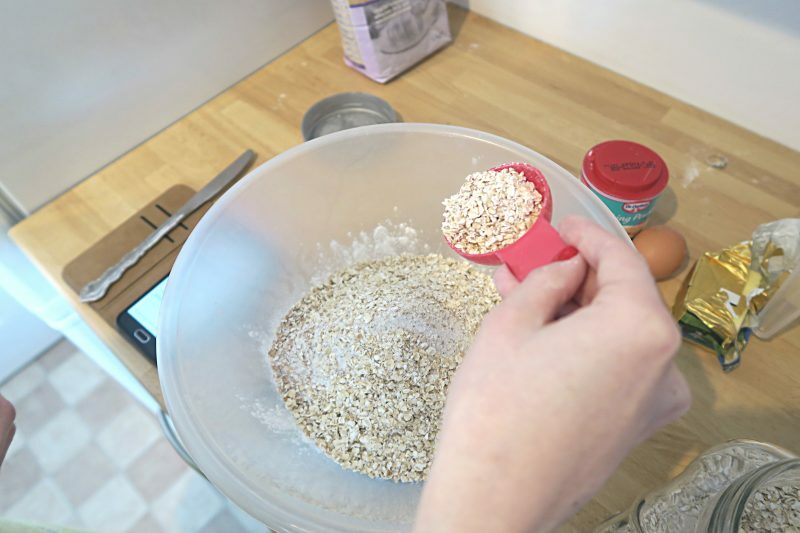 Again mix the oats into your dry ingredients so that the dry bread mixture is well formed. Now it’s onto the messy part of combining the butter and the dry mixture! 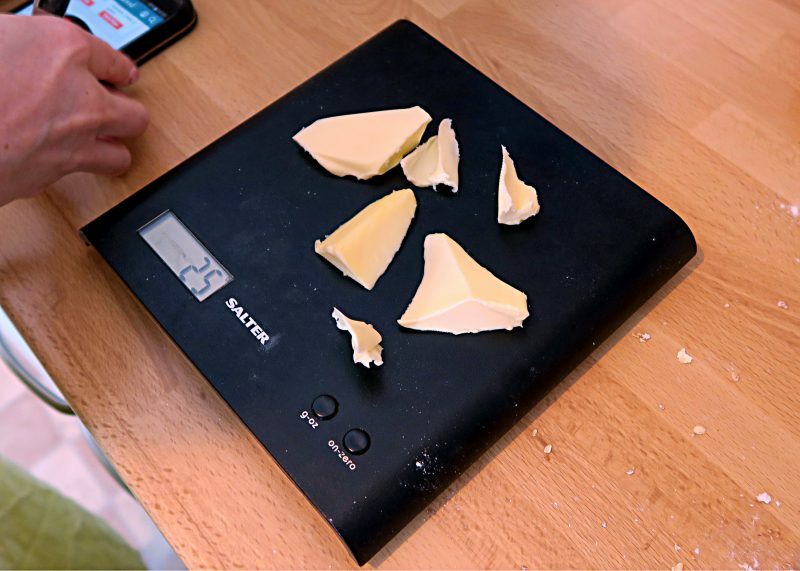 Measure out 25g of softened butter and add this to your dry bread mix. 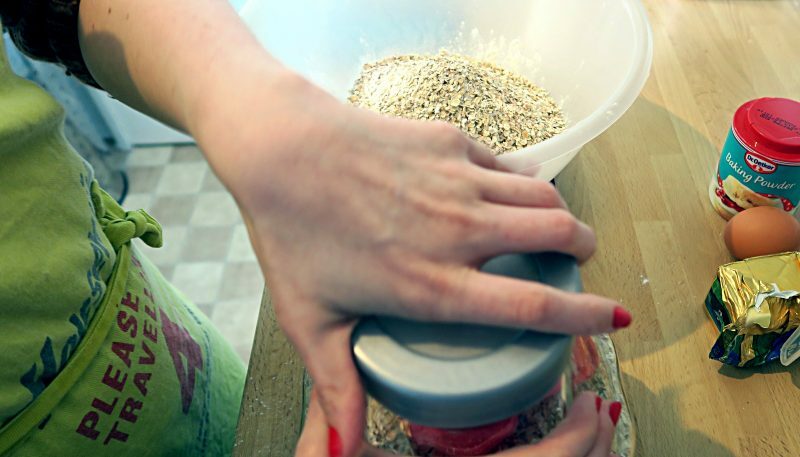 Combine the butter and the mix until the dry mix looks likes bread crumbs. In a measuring jug measure out 400ml of either buttermilk or water (or a combination of both) and beat the egg into the mixture. 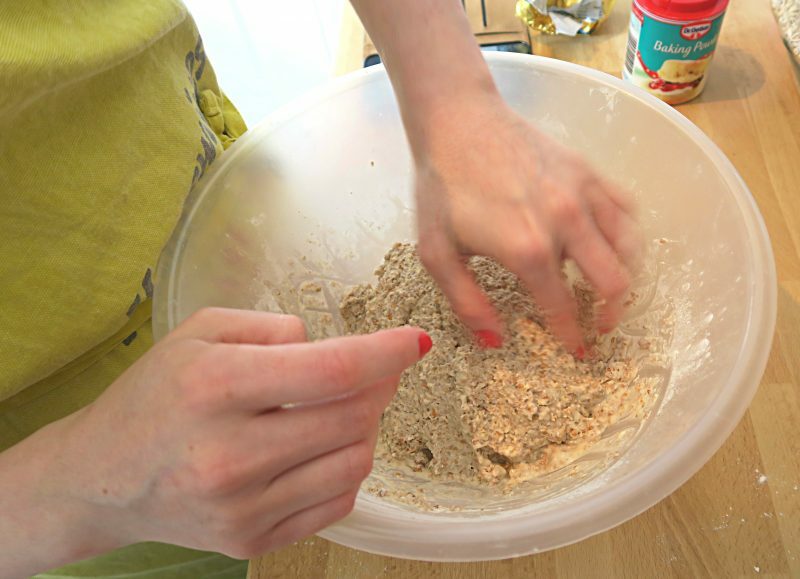 In your mixing bowl make a ‘well’ in the centre of the mixture and add about 3/4 of the wet mixture to the dry mixture. Stir the wet mixture quickly using a normal table knife. 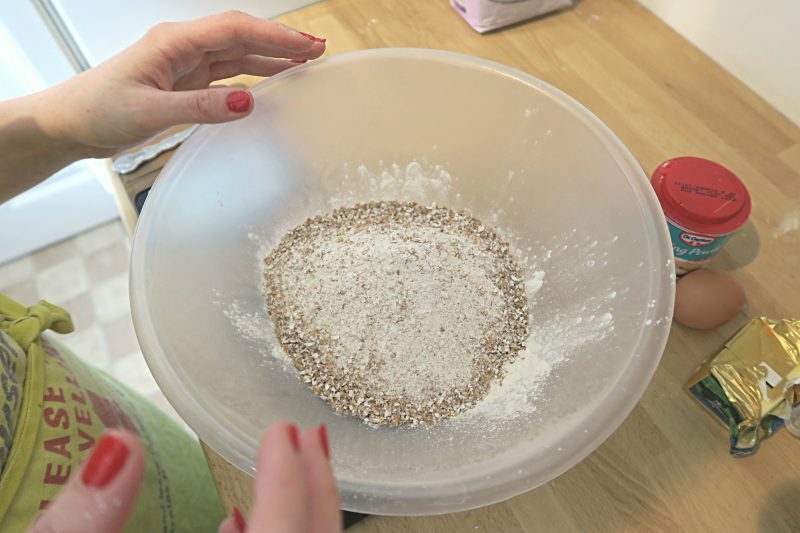 Your mixture should form into a small, rounded ball perfect for kneading. 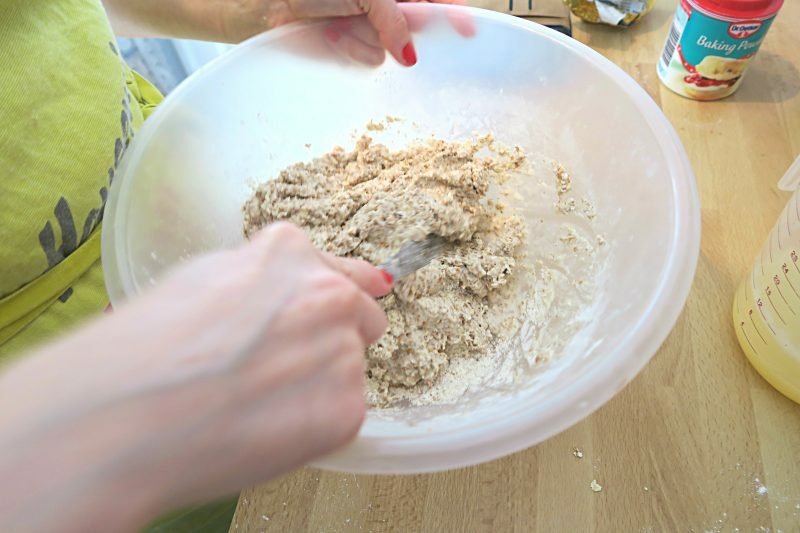 When you are kneading your dough don’t over need it- a few turns with your hand and forming it into a flattened, circular shape is all that is needed. 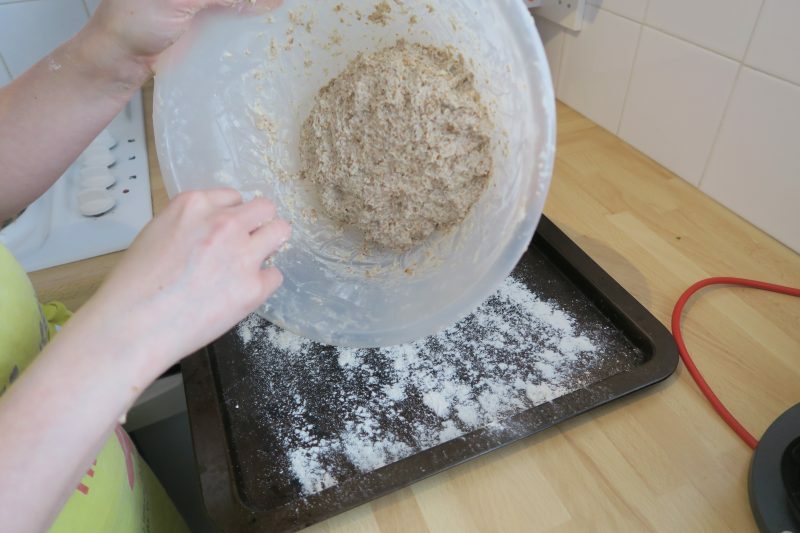 Once you have combined the mixture gently ease the dough onto your pre-floured baking tray with your table knife. 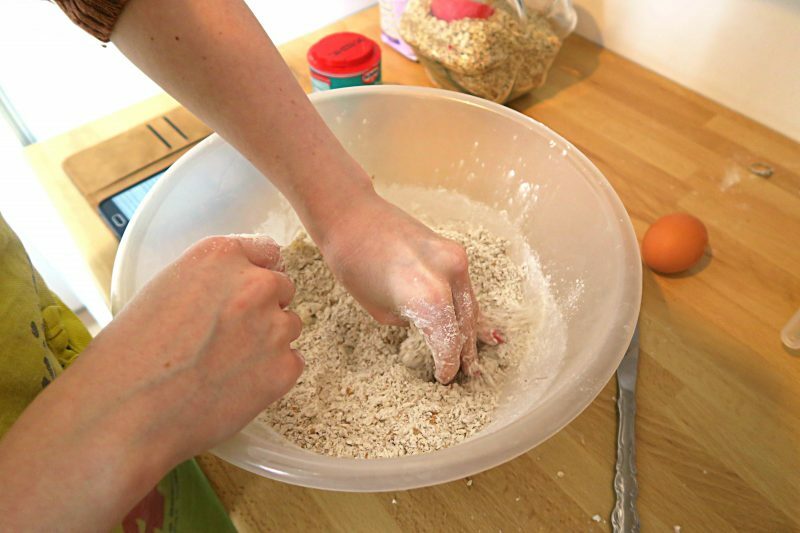 Once it is on the baking tray knead gently into a small, flattened ball shape and again be careful not to over knead the dough! Cut a small cross shape in the middle of the dough, making sure to not cut through the dough to the bottom. Cutting the cross shape is meant to let the faerie’s out according to Irish custom! Your dough should look like this below. Put it in the oven for thirty to forty minutes, checking to make sure the bread is cooking. To know if the bread is cooked tap the bottom of the bread with a knife; if it sounds hollow it’s cooked! Leave to cool on a wire rack with a clean tea towel covering it as this let’s the bread form a lovely crusty rind! Soda bread is delicious straight out of the oven with some Irish butter-hence why there’s no photograph’s of my finished result; we couldn’t wait any longer than an hour after it’s baked and had eaten the loaf by the end of the day! Soda bread is also great as part of an Irish cooked breakfast, with cheese and relish, butter and jam or even with some home-made Irish stew. Soda bread is healthy and can be eaten as part of a healthy diet or in my case a ‘likes to eat all the bread’ diet! 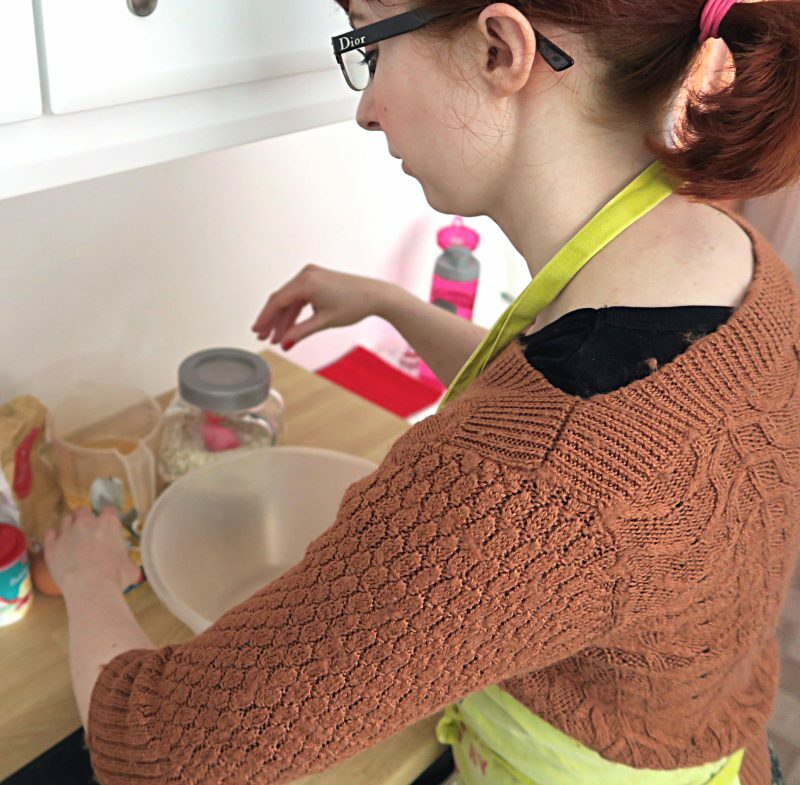 I hope you’ve enjoyed reading this blog post and check out the accompanying YouTube video below if you want a little bit more detail on how to make Irish soda bread! Slainte! Next Post ‘It’s Vintage Darling!’ – Why I Love Vintage Fashion!